In stark contrast to yesterday’s rather low-key and dare I say artistic monochromes of Itsukushima Shrine and its giant torii, here’s a rather bold and colorful version. 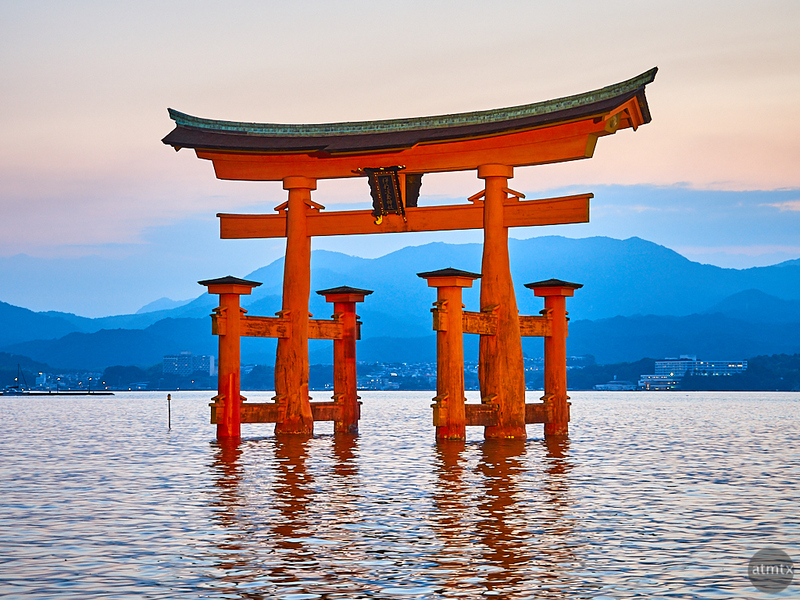 In Japan, Shinto shrines commonly have torii to mark the transition to the sacred space. Itsukushima Shrine has this very large one, in the water, off shore. Fushimi Inari-taisha in Kyoto, by contrast, is famous for having 10,000 of them. It’s hard to get a sense of scale but an average person is a little over half the height of the dark rectangular sign near the top. During low tide, people can walk up to the torii. Here I was close to high tide. Anticipating some lower light photography, I brought my Olympus 12-40mm f2.8 Pro zoom to Miyajima, which works better at night than my longer 14-150mm f4-5.6 travel zoom. I shot this at the maximum 40mm which give a 80mm equivalent framing. At f2.8 still managed the base ISO 200 at 1/20 of a second. This is a rather conventional photo, especially compared to the set from yesterday. However, as a tourist, I’m not above capturing the obvious compositions. You were there at the perfect time. I missed it last time in Japan. Hope to go back next time. I didn’t know you visited Miyajima. Definitely worth another visit. Which should I get, the Olympus PEN-F or OM-D E-M5 Mark II?